A tribute to former NHL player and general manager Gerry Meehan.
" 'Growing up in Toronto and being a big Maple Leafs fan, I hated the Buffalo Sabres,' Shanahan later told Meehan, as the crowd chuckled. 'You made the right pick.' 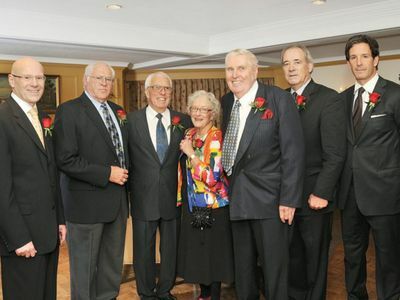 "
In this photo, Meehan is the next to last on the right, next to Shanahan who's on the end. Read more at the Hall of Fame's website. 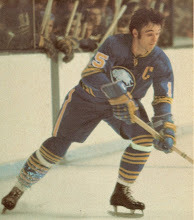 Gerry Meehan as captain of the Buffalo Sabres in the early 1970s. This site covers his entire career with six NHL teams over 14 years.